Rebel Legion :: View topic - Supermegafest 2008 .. Come on up !! Posted: Thu Nov 13, 2008 3:29 am Post subject: Supermegafest 2008 .. Come on up !! Here is is folks.. Kamino Base's requested presence at one of New England's larger "convention"s.
More like a large dealers room with celebs, yet the New England Costumers are planning some big things, and would LOVE to have our extended family there to enjoy the weekend with us. As some of you are perhaps aware of, Alderaan Base has completed a large scale prop of the Landspeeder, which will be at SMF. We will be collecting for Toys for Tots in the front lobby. 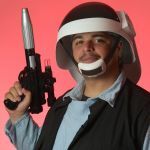 the New England Garrison will be at their usual photo area with their Dewback prop, collecting for the Jimmy Fund. We are looking for help staffing the table and "landspeeder" duty. Please post here and let us know if your interested in coming out to play with us. Post convention we MAY have a get together. Nothing solid yet. Please post here also if your not yet on the AB forums, and plan on registering so that youir access can be granted and posting ability granted. Warrington Gillette - Jason of Friday the 13th Part II. and of course : The "Bat Car" from Batman TV show - Check out this great classic automobile..
* Richard Dreyfus has had to cancel his appearance. Congrats on the speeder, pics look sweet! Oh how I'd love to attend. How we'd all love to hang out with you and Ginger again!! This is tempting. Hell, even I had the woman tempted once I said Richard Dreyfus. Followed by Commander Ryker and that Beetles guy. Be so Tempted you come up and have fun!!! Pete Best - Original drummer of the Beatles - my guess..
Sid Bernstein - Legendary impresario, Sid Bernstein, brought the Beatles to America. or Peter Bennett - Pete was the Promotional Manager for the Beatles, the Rolling Stones and the Who, as well as Personal Manager and Promoter for the individual careers of John Lennon, Ringo Starr, George Harrison, and Paul McCartney. LOL, Justin, you are totally correct. My fiance is a HYOOGE beatles fan and explained to me who this guy is. And while I am a fan of the monkees, being able to meet the one and only Commander Riker is the draw for me. That and seeing the landspeeder and dewback up close and personal! "There's TWO O's in GOOSE"
But can you get me in, feed me, let me sleep somewhere, and bring me back down? There are a lot obstacles in my way...mainly lack of funds.